When the University Men's and Women's clubs merged into one club in 2014 we began making new club history, but before then each part of the club had its own long and glorious tale. We have tried to capture some of that in the following information and pictures. At a Sports Union meeting on 2 April, 1912 it was decided that a Women’s Hockey Club should be formed. The Union agreed to allocate ten pounds towards equipment for the women. The Sports Union would buy the sticks and keep them in repair if each girl using one paid two shillings per year, although this charge was dropped in the following year. There were no other Women’s Hockey Clubs in Brisbane at the time and to get two teams from the small number of women students the University was almost impossible. The handful of enthusiasts sometimes had to recruit some of the men students when they wished to play a game. Professor Priestly of the Mathematics department, who had been a British representative goalkeeper and a Cambridge Blue, enthusiastically coached the players. He and Miss Freda Bage, the first Principal of the Women’s College, were two of the club’s keenest supporters and became its first patron and patroness. In 1919, the club members received a letter asking them to participate in their first intervarsity in Sydney. The Queensland girls were used to playing in sandshoes and this brought them to grief on the wet, slippery fields of the south. The costume of teams in all states in 1919 included long, heavy skirts.The Queensland girls rebelled and designed a uniform of bloomers and middy blouses. As Mrs Julia Hulbert (nee Birkbeck) recalls, this was a source of some amusement when they bravely appeared at intervarsity. A few years later, however, tunics came into general use. Mrs Hulbert played for the team in intervarsities in Sydney in 1919 and 1921 and in Melbourne in 1920. She was also able to arrive back from London in 1923 in time to play with the side in Sydney. At that time there were so few students at the University that graduates of less than two years’ standing were eligible to compete in intervarsity competitions. During the early history of the University, hockey was the major women’s sport, although few girls were familiar with the game from their school days. According to Professor Dorothy Hill, who attended Brisbane Girls Grammar, it was considered too unfeminine and altogether too dangerous for girls, although Brisbane State High, Warwick State High and Maryborough Girls Grammar School apparently played it. At a Sports Union meeting in August 1914, permission was given for the University women to play a match against Maryborough Girls Grammar team. Inter-year games were also occasionally played. In 1914, the Sports Union’s Annual Report noted that the combined second and third year students had defeated the first years by 6 goals to 3. Most players were therefore virtual newcomers to the game and this, combined with the rough and unprepared surface of the Domain where they practiced, produced a rather unpolished brand of hockey that relied on running speed rather than skilled stickwork. When they wished to play, the girls had to ask Dante, the Domain’s Italian gardener, to erect the goals and to mark out some white lines when it was necessary. Since any attempts at dribbling on the Domain were thwarted by large tussocks of grass, it was easier to forget it as a means of moving the ball. Despite this lack of technical refinement, Misses Birkbeck, Cran, Gordon, Smith, Brown, Ford and Martin won Blues in 1919. They were the first Queensland University women to do so. On 23 March 1923, an inaugural meeting was held to plan the formation of a Queensland Women’s Hockey Association with representatives from four Brisbane teams – University, Federal Taxation, St Andrews and Brisbane State High School. Miss Bage was later elected patroness, and University players Nesta Brown (who introduced hockey at Brisbane State High School) and “Topsy” Bartholomew were the Association’s first president and secretary. Freda Bage was later the president in 1927 and from 1929 to 1931, and was made a Life Member of the Association. The girls’ lack of ball control was made apparent when they played intervarsity or interstate games. They won their first and only intervarsity in 1924, although they have tied for the honour since. Perhaps this was largely because it was held in Brisbane and the southern teams were not used to the rough and bumpy fields which the local girls had mastered, although the Woolloongabba Cricket Ground where games were played was certainly far smoother than the Domain. His Excellency, the Governor of Queensland, watched the opening matches. The first Queensland side was chosen in 1924 to play the Combined Universities team. Even the leather strips some of the girls persuaded an obliging shoemaker to nail across the soles of their sandshoes were not much help in the wet. The umpire stopped play in one match while Queensland’s Dorothy Hill and her opposing center forward searched for the ball they were trying to bully off. It had become completely buried in the mud. In 1926, the intervarsity was in Melbourne and in 1927 it was in Sydney where the Queensland team was captained by Dorothy Hill. Match experience prior to intervarsities was gained through participation in the Brisbane Women’s Hockey Association fixtures which were played at Graceville on Saturday afternoons.Other clubs included Taxation, St. Andrews and Valley. Unlike the men’s teams who usually stayed in hotels on intervarsity trips, the women were billeted in private homes. The Sports Union gave a small contribution towards the expenses of the trip but most was raised by the girls themselves, usually from dances at the Main Hall to which 3/3 entrance fee was charged. Coffee was boiled on gas rings in the Women’s Common Room and carried in petrol drums to the Men’s Common Room where supper was served. University was also one of the leading state teams and frequently supplied around one-third of the Queensland team. In 1928 the University players were Greta Ferguson, Dorothy Hill, Gwen Spurgin, and Alma Foggett. It was only through the early morning training sessions with the state squad on the almost billiard table surface of the grounds at Woolloongabba that they began to learn the rudiments of dribbling. Interstate and intervarsity carnivals were invariably held in successive weeks. In 1928, the four University girls had to travel from Adelaide to be in Brisbane for the inter-varsity programme within a few days. They took the train to Coolangatta, but because of the rail strike were forced to take a taxi to Brisbane to be there on time. “Prof” Priestley took a keen interest in every game the Queensland University girls played and was a representative on the panel, which recommended the award of A.U.S.A Blues. Intervarsity was always taken very seriously. Each night the players went to bed early hoping that a good rest would help their game the following day. Besides the final luncheon or dinner, the week was usually interspersed with occasional picnics, motor car trips, boat trips, evenings at the theatre and special morning or afternoon teas. One incident which most early players vividly recall was that of the ladder for the Women’s Common Room. During the University vacation of 1927, the Works Department had erected an eight or nine foot galvanized iron fence around the boundary of the University grounds to keep undesirables away from the Domain. The fence also meant, however, a long trek for the hockey girls to reach the gate, which was sometimes locked when they got there. Hockey was an important part of the life of all girls in the club. One father is quoted by Greta Ferguson as replying to all who asked what course his daughter was studying, that she was enrolled in “The Hockey Course”. In 1928, the team won the Brisbane Women’s Hockey Association premiership. Sydney, Melbourne, Tasmania and Adelaide University teams travelled to Brisbane for the inter-varsity that year. Games were played on the Exhibition Oval and the Woolloongabba Cricket Ground. Greta Ferguson captained the Queensland side, which took the visitors on a tour of the University, for morning tea at Mt. Cootha (One Tree Hill), an afternoon river trip and a motor picnic to Redcliffe during their stay. The farewell dinner and presentation of the Cup was held at the Anne Hathaway Café in George Street. Four years later, Gwen Spurgin was named in the Combined Universities and Australian teams. She was chosen to play on the right wing for the Combined team in 1936 when intervarsity was held in Brisbane. Queensland tied for first place with Melbourne that year and Miss Bage presided at the dinner. Jean Hyde, considered at the time to be one of the best women hockey players ever produced by the Queensland University, was selected to the right half position in the 1938 Australian team. Margaret Harper played in the Queensland I side and Theo Pickvance for Queensland II in 1937. No intervarsity carnival was held that year. It was to have been played in Hobart in August, but was cancelled because of infantile paralysis epidemic sweeping Melbourne. Strong players in the 1938 team led by Margaret Grimes, included vice-captain and fullback May Evans, her co-fullback, Pat Marks, goalie Thalia Kennedy and Amy King-Koi in the forward line. Practice sessions were held in Perry Park. Thalia Kennedy was still defending University’s goal in the early 1940s. Other members of the 1941 team were Joyce Barrett, whose brother Tim was later captain of the men’s team, Ann Darvall, Frances (“Butch”) Butcher, Professor Priestley’s daughter, Ann, and Marj Allsop. Ann Darvall was an outstanding player for the club during this time and gained selection in the Brisbane team. Interclub competition was of a poorer standard during the war years, however, with so many previous players being involved with war activities. Ruby Robinson, a long-time supporter of women’s sport in Queensland, coached the girls for a time during the war. The club was the only one affiliated with the women’s Sports Union, which was particularly active during this period. A women’s air force team was involved in fixtures at this time. Interfaculty and seven-a- side games with the men were also continued. The B.W.H.A organized a “Dig for Victory” which involved University players, although by 1943 only the faithful few were still regularly taking part. The University girls spent their Wednesday sports afternoons digging vegetable gardens at a convalescent home at Chelmer. Digging these gardens was their contribution to the war effort and was thus termed a “Dig for Victory”. In 1943, the club sent a team to play Maryborough at the same time as the men. The University women were surprised to find the country players wearing a uniform, which did not include the traditional black stockings! It was decided by the Women’s Sports Union in September 1945 to enter a hockey team in the 1946 intervarsity competition. University Players chosen to represent Brisbane against Maryborough in 1945 included Joan Park for Brisbane I, Dorothy Cramb and Kay Park for Brisbane II and Fay Cossins for the Brisbane III team. Dorothy Cramb and Joan Park were awarded Blues for the year. Dorothy, a third year Arts student, was club president, the most versatile player in the forward line and the team’s most prolific goal scorer. Joan, who was a third year Physical Education student, captained the side in 1944 and 1945, after Joyce Barrett. For the first time since before the war, two teams were fielded in 1945, although the varsity II players were all very new to the game. Dorothy Cramb captained the intervarsity team to Adelaide in August 1946. "The women played in Melbourne in soaked clothes, bare feet and inches of mud until the last two days. It was a messy business." Adelaide won the Cup, closely followed by Sydney and Perth. Hobart also played well to defeat the West Australians but Melbourne and Queensland had not reached the same standard of play as the other four. University’s coach in 1949 was Gwen Risson (nee Spurgin) who had played with the club during the 1920s and 1930s. The 1950s and 1960s produced some outstanding players. Maureen O’Moore was chosen in the Combined Universities team in 1957 and Mary Ambruster and Judy McGoggan were selected in the team in Melbourne in the following year. During the years in between 1948 and 1953, University players chosen in Brisbane representative teams included Mary Armbruster, Jeanette Knox (who was president of the women’s Sports Union in 1953), Gillian Davey, Daphne Corder, Maureen O’Moore and Janet Teys. In 1955, Alisa McMurray and Judy McGoggan were selected in the Australian Universities, which toured New Zealand. New Zealand made a return visit in 1957 when intervarsity was hosted and won by Tasmania. Janet Teys first representative game as a University players was in 1949, when she was included in a Combined University Reserves team to play a Queensland country team at Marchant Park. She later gained selection for Queensland from 1952 to 1955, in 1957, 1958 when she captained it and 1960 when she was vice-captain. In 1959 she was named in the Australian team to tour Holland and four years later was the Australian delegate to the International Federation of Women’s Hockey Associations (I.F.W.H.A.) Conference and Tournament in Baltimore. She played in the tournament as a member of the International Wanderers team. She is a Life Member of the Brisbane and Queensland Associations, has been the Queensland secretary since 1959 and a member of the Australian Council from 1960 to 1963 and since 1979. The first game against the University of New England was played in Armidale in 1950, when Helen Laws captained the Queensland University side. One of the club’s best intervarsity performances for many years was a third place in Melbourne in 1952. The team, led by Mary Armbruster, included Janet Teys, Betty Smith, Nan Durrans, Maureen O’Moore, Judy Andrews, Gill Davey, Daphne Corder, Jeanette Knox, Judy McGoggan and Betty Elmslie. Mary Armbruster, who learnt her hockey at Warwick State High School, coached the side for several years in the early 1950s. Practices were held at Victoria Park at 7.00am on Friday mornings and on the Wednesday sports afternoons. Gwenda Weir played for the state from 1954 to 1958. Like many Teachers’ College students, she played for University while she was an evening student there. Gem Marshall was a member of the club from 1955 to 1958 and played for the Combined Universities team in 1956, in 1957 against New Zealand in Adelaide and in 1958. She gained selection in the Combined Universities team in 1956, 1957 and 1958. Rae (“Moppy”) Michod captained the Queensland University side, which traveled to Perth for the 1958 intervarsity competition. Heather Scraggs is a Life Member of the Q.W.H.A. and one of the foremost women’s hockey umpires in the world. She played for Queensland University in an Adelaide intervarsity carnival in 1971 and for the state from 1959 to 1968 and in 1970. She toured England in 1967 and South Africa in 1970 with the Australian side, gained her Australian Umpire’s Badge in 1970 and was graded one of the world’s best at the I.F.W.H.A. Tournaments in Edinburgh in 1974 and Vancouver in 1979. She was invited to umpire at the World Cup tournament in Madrid in 1978 and as one of the three Australian umpires to officiate at the Moscow Olympics, but all Australian umpires withdrew when the team pulled out of the Games as a protest to Russia’s invasion against Afghanistan. Science student, Kay Kindervater, played for Queensland from 1964 to 1971 and in 1973. She captained the side in 1971 and was vice-captain in 1968, 1969 and 1970. From 1965 to 1967 and from 1969 to 1971 she represented Australia. In 1967 she was vice-captain of the team which toured Germany. She went to England in 1969 and South Africa in 1970 which the Australian side and in 1971 was vice-captain of the Australian delegation to New Zealand. In 1968, she was awarded the U.Q.W.S.A. Cup for outstanding individual performance. As more universities began to participate in intervarsity in the 1960s the competing teams ere divided into two pools. Queensland scooped the pool in the second division in Hobart in 1968, having only one goal scored against them in the entire carnival. 1974 was the club’s most successful year in a long time. Three teams won their way to the semi-finals and C1 and C3 teams were both equal premiers in their grades. By 1977, four teams were fielded (A3, B2, C1 and C2) with the help of the three coaches and a trainer. The first and second teams reached the semi-finals and the top team won the A3 grand final. At the Perth intervarsity Queensland ran seventh out of 13 competitors. In the following year “A” Reserve, B1, B3 and C1 teams were entered n fixtures. When intervarsity was held in Canberra in May, Joan Carrick and Carol Cave were selected in the combined intervarsity side to play New Zealand Universities. Joan was also selected along with Kim Dwyer in the 1979 Australian Universities team, but their proposed tour of New Zealand did not eventuate. Joan has been the top University player of recent years, being chosen in the Brisbane senior team in 1979 and 1980. The club’s most recent representative player was Robyn Counter who toured New Zealand with the Australian Universities team in 1980. This history is largely adapted from an article written for BHA’s Golden Jubilee in 1982. It has been slightly modified and recent history has been added, mostly by the 2010 executive. The club celebrated its 85th year in 2009 with a fantastic dinner. Another milestone marked in this period was the 50th consecutive year of service of Buck McBryde, which was celebrated with an ‘old-school’ grass hockey carnival at the St Lucia fields and a black-tie dinner. On the back of these events, an Old Boys Alumni Club was initiated in 2010 to work alongside the club on various matters and assist in networking for the club. The University of Queensland Hockey Club was founded in 1924 and during the last 85 years has maintained strong traditions of lasting friendships fostered by the spirit of Intervarsity and the maturation from undergraduate to graduate. The Club joined Valleys (1921) and Saints (formed late 1923, commenced playing in 1924) as the first clubs in Brisbane and as pioneers in developing Hockey in both Brisbane and the State of Queensland. The club was developed under the auspices of the UQ Sports association of the time and its creation pre-dated the creation of the Brisbane Hockey Association (BHA) in the early 1930’s. Because of the transient nature of club members, rarely has long-term development evolved within the club. Subsequently its history is one of names, dates and upheavals rather than gradual change. In 1924 only Sam Weller had played before and was the automatic choice as captain. In fact Victor Grenning, the club's first Queensland representative was previously an outstanding footballer. The club competed in a Brisbane competition in its first year, with the Q.H.A taking responsibility for hockey fixtures in the early years. Hockey competition between the universities began in 1924 and in 1925 the Syme Cup for Inter University Hockey was donated by Sir George Adlington Syme, a surgeon and member of Melbourne University Council. 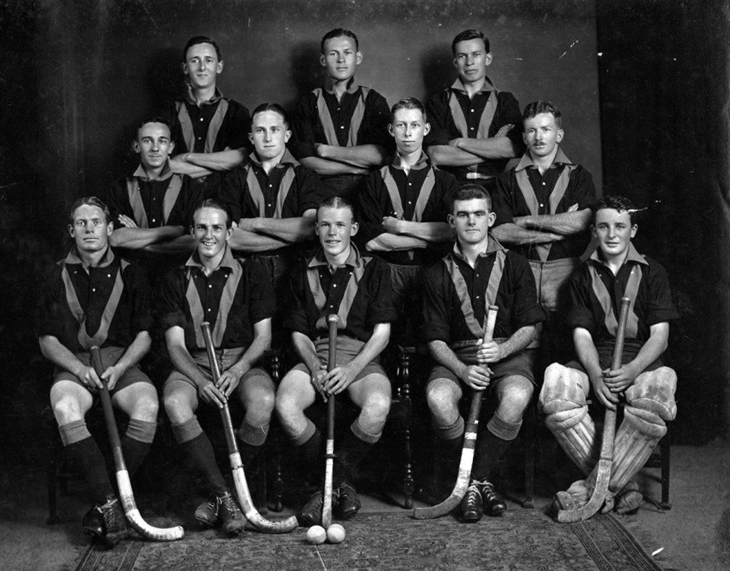 The 1930 UQ Hockey Team. Image Courtesy of UQ Archives, Records and Archives Management Services. The 1930s could perhaps be considered the Mahoney Era. Although the decade produced a number of fine players who represented the state, the Mahoney name was prominent in University, Queensland and Australian teams. The eldest of the trio was Bernie (B.P.) Mahoney who played for the state in 1932 and 1933. Bill and John Mahoney were twins. Bill played for Queensland in 1934 and from 1936 to 1939. John played with the club from 1934 to 1944 and 1946 to 1948, for Queensland from 1934 to 1939 and Australia 1935 to 1937 being captain in 1937. 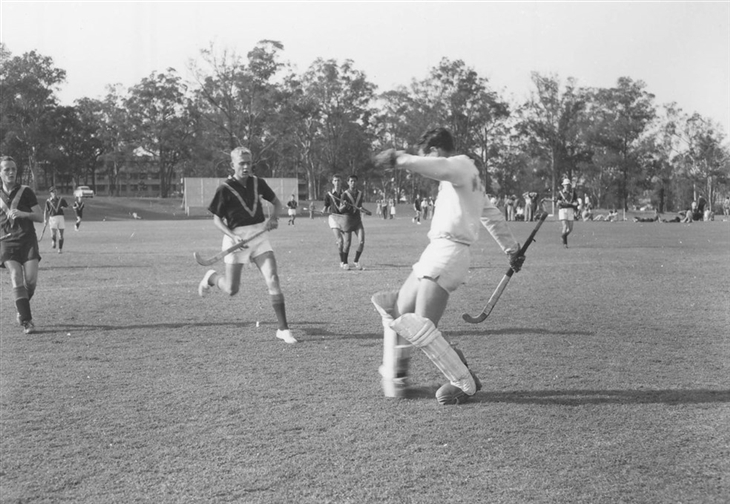 These early years began the strong and proud tradition of UQ in Intervarsity Competition, with UQ becoming one of the backbones of Intervarsity hockey and winning the Syme Cup in 1929, 1933 and 1936. The club did not fold during the war years and played its first game on the new fields at St Lucia in 1940. The No 1 Oval was considered easily the best field in Queensland in the 1940s and was still amongst the leading fields in the state until the 1980s. During the war period fixtures were not held, however the University held games against the Army, RAAF and civilian teams. Local fixtures recommenced in 1944 and in 1946 Intervarsity hockey recommenced. 1946 was also significant, being Jack McAllum's first of over 50 years at the club. The 1950s and 60s were a golden age for the club, producing its first premiership as well as a swagger of Queensland and Australian representatives. John McBryde was a Queensland Colts player and a captain of the Combined University teams in 1958 to 1959. In 1960, 1961 and 1964 to 1966 he played for Queensland. His period of Australian representation from 1960 to 1966 included the Rome and Tokyo Olympics, being captain in Tokyo. John went on to coach the Canadian national team in later years. Lou Hailey was an outstanding keeper of the 50's and represented Australia at the 1956 and 1960 Olympics. 1959 was the first year of State hockey for another brilliant Uni player, Don McWatters. Don represented Queensland from 1959 to 1968 and Australia from 1961 to 1968. Don was the captain at the 1968 Olympics, making it consecutive Olympics at which Australia were captained by a member of the UQ Hockey Club! Don was forced, through injury, into early retirement but went on to coach Brisbane, Queensland and Australian teams. The 1960s were dominated by McBrydes John, Ian and Bruce. Indeed, Bruce played his first game of game of hockey for the club in 1959 and would go on to celebrate 50 consecutive years of on-field service for the club in 2008! 50 years consecutively playing for the one club! Intervarsity Hockey Match at the Uni 1963. UQHC vs MUHC. Image Courtesy of UQ Archives, Records and Archives Management Services. The 1964 team, which included Don McWatters, all three McBrydes, Lou Hailey and other Queensland reps won the club's first and only first division premiership with a 3-2 win over Valleys on the University's No 2 Oval. The premiership was the club's first in any grade. Goal's to Bruce McBryde, Don McWatters and Ian McBryde secured the famous victory for the Redmen. Uni took a 3-1 lead early in the second and managed to hold on in a tight finish, despite the efforts of BHA umpiring stalwart Vic Morrow who sensationally sent off Uni goalkeeper Lou Hailey with the match delicately poised at 3-2 late in the second half. Remarkably, Don McWatters and the three McBrydes grew up in the same street in Maryborough originally and they developed their skills with regular backyard games throughout their childhood. The street produced two Australian Olympic captains and was largely responsible for delivering the University its sole first grade premiership! Aligning with this golden age of hockey in Brisbane, UQ would also go on to completely dominate intervarsity hockey during this period. Several of the State and Australian players were also eligible for Intervarsity hockey, creating teams that won 12 Syme Cups between 1946 and 1967, with several more runners-up medallions and many players chosen for Combined University representative honours. The 1970s could not match the competitive success of the previous decades. The club has long relied heavily on country players and during this period the standard of Brisbane hockey far outstripped that of the provincial centres. Changes in the education system during this period with the introduction of semesters and continuous assessment meant that players could no longer put hockey first and study second. In 1976 the club formed a short-lived junior team in an attempt to develop depth within the club and a more Brisbane orientated base. This sometimes on-and-off experiment lasted into the mid 80’s, and the junior part of the club actually collected some silverware, runners-up in the 1979 U16-3 competition. 1974 was the jubilee year for the club and funds were collected for improvements to the Clubhouse. These were completed in 1980 when the club's first captain, Sam Weller, unveiled the club honour boards. The 1980’s saw the arrival of several of the current University stalwarts. Even with a lack of success in Brisbane, the club picked up 4 Syme Cups over the period, in ’71, ’73, ’81 and ’85. The 80s also saw the emergence of I.V. legend and subsequent club and BHA stalwart Dushen Salecich, who would go on to participate in 11 straight I.V. campaigns as player or manager. The very early 90s saw a good crop of players, with a Syme Cup victory in Perth in 1991 eventually stripped after the officiating body ruled the combined Qld Uni team (with QUT/Griffith - required to ensure a team was sent to Perth) was ineligible for the title, despite having said otherwise at the beginning of the tournament. This would mean that 1985 would be the last time UQ has won the title, although there has been some moderate success of late as the club looks to build on its history of winning the most Syme Cups in history. 1992 would also prove to be the last year the 1st grade side made the finals, as the team unfortunately became competition easy beats and, in a more diversified competition, were relegated to second grade in the mid 90s. This didn’t last long though, as a crack administration and coaching team was formed to bring the side back into first grade within one season, where they have remained since. The move to synthetic turf pitches was not all good news for the club, with the relevance of their home grounds at St Lucia becoming diminished. This culminated in a complete lack of fixtures at home, with the price UQ sport setting for field hire much too high to compare to other locally run suburban grounds. This was the first nail in the coffin of the Club losing its home identity. Another disappointing milestone in the history of the club was in the early 2000’s, when the decision was made to completely renovate the clubhouse that was being shared with the Cricket Club. It was demolished in 2002 and with the hockey club unable to contribute the funds to match Cricket or UQ Sport, the cricket club was able to completely take over the new clubhouse. This meant the loss of that true club focal point for the future generations of players, a sad moment for the club indeed. One of the biggest events of this period was the abolishment of Compulsory Student Unionism by the Howard Government, initialised in the mid 2000s and taking affect in 2006. For a long time, The Sports Union had received money through student unionism and this in turn had helped to fund the sporting clubs. With this resource suddenly removed, the club’s finances were in an extremely poor state. The mid to late 2000s saw a transition of the club, with a focus by the administration to stabilise the finances and take the club into the 21st century. Electronic registration and record keeping was introduced and the club returned to its roots in building its club around country and regional players, as in times gone past. The club has tried to keep pace with changes in the hockey and club landscape by instigating a longer term vision designed to keep the club sustainable. During the late 2000s, numbers have stayed strong and this has bucked the trend of decreasing popularity in hockey in general. The club has generally been able to field teams in all of the senior men’s divisions and although numbers do fluctuate from season to season, the club has continued to grow overall. Intervarsity hockey changed dramatically in this period, with the removal of a stand-alone hockey tournament and the introduction of ‘Australian University Games’ in 1993. UQ would continue to send teams to most A.U.G.’s through this period, although the cost sometimes proved prohibitive. Success was seen in 2007, with a Gold Medal in Division 2 after several years of not attendting A.U.G.s, and 2009, with a Bronze Medal in Division 1. Throughout its history, University of Queensland hockey club has undoubtedly helped develop hockey in Brisbane and Queensland. The club, especially through its members, has contributed enormously to hockey in the area and also, by this is well recognised by the Life Members and Hall of Fame inductees for both Hockey Queensland and Brisbane Hockey. It can be especially said that the club has had an impact on the game throughout the state, country and even the world, with the transient and travelling nature of the players meaning lessons learnt here have been taken with them wherever they may travel. Full lists of awards and other achievements of UQ Club members, as well as our premiership and Syme cup teams, can be found in the Honour Boards section.